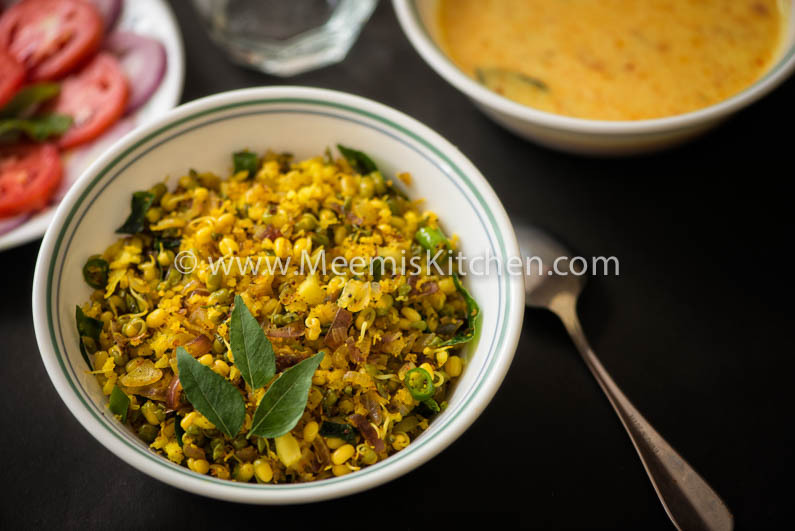 Sprouts Thoran or Mulappicha Cherupayar thoran is a nutri rich thoran; a great side dish for rice.My love for sprouts started only a few years back. 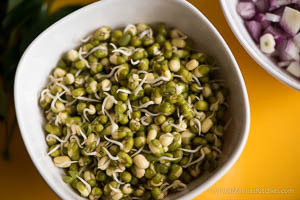 I had tasted sprouts in salads and was not much fascinated by the health benefits or its bland taste. Then one day at Kochammu’s (my darling aunt) home, saw her making this Sprouts thoran; she just stir fried the sprouts for a few minutes and it turned out yummy. So, I was promptly interested and was quite happy with the results. This has now become a regular thoran in my home and my kids also like it very much. The health benefits are so many and whoever is having trouble including this in diet, please give this recipe a try and you will instantly be motivated to add this in your diet. Please check the health benefits below as well and you will be more than pleased about adding this in your lunch chart. I am always on the look out for healthy thorans to include in my diet and I have quite a list- Peechinga Thoran, Mushroom Thoran, Vazhakoombu Cherupayar thoran, Vazhakka Cherupayar thoran, Vanpayar Thoran, Padavalanga Thoran, Cabbage Cherupayar Thoran, Kovakka Thoran, Beans Thoran, Cheera Parippu thoran; the list is long! You may also like my other combination thorans like Carrot Beans Thoran, Cabbage Irachi thoran, Chemmeen Manga Thoran etc. We get Moong sprouts in the market, in plastic covers or bowls, but I grow my sprouts at home to make this Sprouts thoran. Growing sprouts at home is simple and quite easy and you can be sure about the hygienic factor. 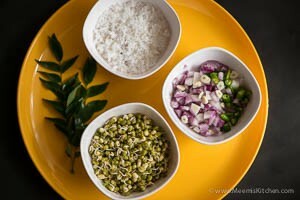 So I advise you all to grow your sprouts at home to make this healthy sprouts thoran. It just take 36 hours or a little more to get good sprouts. So, ready to go that extra mile with me? Come on, you will not regret it, I assure you. 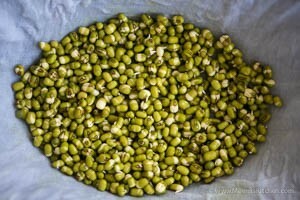 Take a handful of Moong beans (cherupayar/ green gram) or more and wash two or three times. Pour enough water to cover the moong beans and an inch more. Cover and keep overnight. Drain the water and put very little water (2-3 tbsp) and cover and keep for another 5-6 hours. Drain and keep in a clean wet cloth and cover the vessel with lid overnight. By next day morning the sprouts will be ready. Chop the onion and garlic, cut green chillies into rounds and keep aside. Heat little oil in a kadai, pop mustards and add curry leaves. Add the chopped onion, garlic and green chilly and sauté. Add Turmeric and Pepper Powder and sauté. Add the scraped coconut and fry for 2 minutes. Add the sprouts and sprinkle salt and stir fry for 1 full minute on high flame. 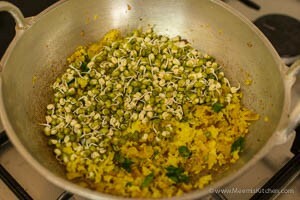 Always use very little oil, especially for sprouts to make it healthier. Sprouts should only be stir fried and need only a minute to cook. No water is required for cooking. Sprouts should be grown in a clean surrounding away from pets. If you are buying from market, always buy fresh sprouts and use immediately. Wash it thoroughly to get rid of all dirt and impurities. Sprouts are full of proteins, anti-oxidants and vitamins. It has fewer calories and essential therapeutic benefits to keep you fit and healthy. Sprouts regulate Blood Pressure, Sugar and cholesterol in our body. It is beneficial for maintaining beautiful skin and hair. Add this Sprouts thoran to your regular diet and be healthy. God Bless!